Our purpose is reflected in The New Pioneers manifest and Give & Grow principle that guide our daily work in The Social Business Company. 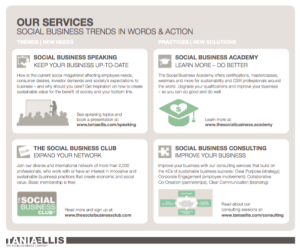 The Social Business Company® puts social business trends and practices into words and action. We inspire and help companies and entrepreneurs put economic and social value creation into the heart of their business and organization. For the benefit of society and the bottom line. The world is changing – and so are companies. Because when society’s needs change, business must adapt. The business of business is still business, but the rules of how to stay in business are changing – no matter whether you’re in the business of creating shareholder value, of providing welfare solutions or of making the world a better place. We believe that sustainable practices that create both economic and social value will secure business and long-term growth as well as the well-being of people and planet. We believe that social responsibility can be used as a means of generating economic value – and that business can be used as a means of generating social value. 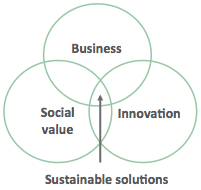 So to us ‘social business’ is about working across the fields of CSR – corporate social responsibility (using social value creation as a means to do business), social innovation (developing solutions to social or environmental challenges) and social entrepreneurship (using business methods as a means to create social value). These beliefs are the foundation of The Social Business Company® – a purpose-driven company in business of creating social and economic value for the benefit of society and the bottom line. 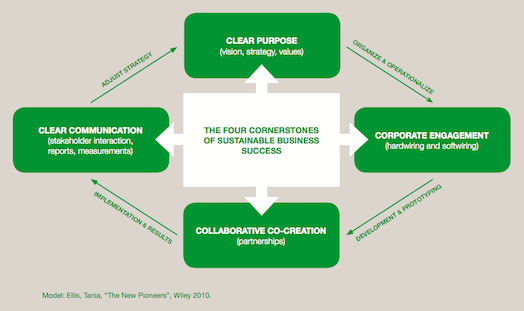 We work with particular focus on linking business objectives with social/sustainable goals and innovation through our four cornerstones: Business strategy; Employee engagement/employer branding; Innovation through shared value partnerships/stakeholder engagement along the value chain; Sustainable communication/corporate branding. Read more about our four cornerstones here. Our clients – who benefits from our services? The diversity within the field of social business is also reflected in our wide range of clients across sectors and industries: ministries, unions, business schools and universities, municipalities, NGOs, business networks and associations, think tanks, trade unions, entrepreneurs, medium-sized companies and multinationals. Get inspiration from our diverse range of bold and forward-thinking clients across sectors and industries in our Cases & Clients section here.